This is a guest tutorial by Phil Gosch from SaphireStudio. This tutorial will focus on uploading directly from within Blender. 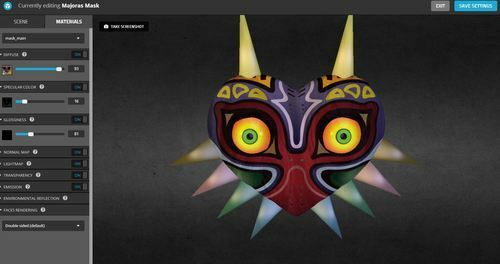 I'll be using my model of Majora's Mask from the Legend of Zelda series as an example for this tutorial. So let's start Blender version 2.79 or above. If you have a look at the toolbar (T) you can see the newly introduced tabs. One of them should read File I/O and, if clicked, show the fields for Sketchfab uploads. If this tab isn't there you have to first activate the add-on. You can do so by heading to File > User Preferences, click the Add-ons heading and search for "Sketchfab" there. You should then see Sketchfab Exporter and click the checkbox there to activate it. Be sure to click Save User Settings and then you should see the File I/O tab available. The next step is to prepare your model/scene. First, you should convert your paths/surfaces/text objects to polygon meshes (by selecting the object and pressing Alt+C). Odds are high you have a finished model originally intended for Cycles Render or Blender Render. If that's the case, and you're using complex node setups for mixing different color textures for a single material inside Blender, it is best you bake down your textures to a single color-texture (Blender Internal Baking does a fine job at this). The same applies for specular-, specular-color-, glossiness- etc. maps. I recommend using UV-mapped textures. Sketchfab supports Blender Internal Materials (diffuse: toon, lambert, fresnel, Oren Nayar, mineart and specular: cooktorrence, phong, blinn toon, wardiso) and mixing/multiplying of textures. However, I recommend the way described above for full control over the end result. Also very important: Give meaningful names to your materials! When you have a drop-down menu in the Sketchfab interface and all the entries just read "material.001, material.002, material.003, ..." you're going to have a very hard time finding the one you're looking for. We will be fine tuning the materials and textures later via the Sketchfab online interface, so be sure to properly name your materials. And related: Try to avoid special characters in your material and texture file names! The Model setting lets you choose if you want to upload the current selection (Selection) or all objects in your current scene (All). Pay attention to hidden objects and layers as these could result in uploaded models being empty! The Lamp setting works similar to the Model one, it let's you select if you want to export all lamps in the scene (All), only the currently selected lamps (Selected) or no lamps from your scene at all (None). In the case of None the default Sketchfab lighting will be used, which is two default directional lights on the camera. 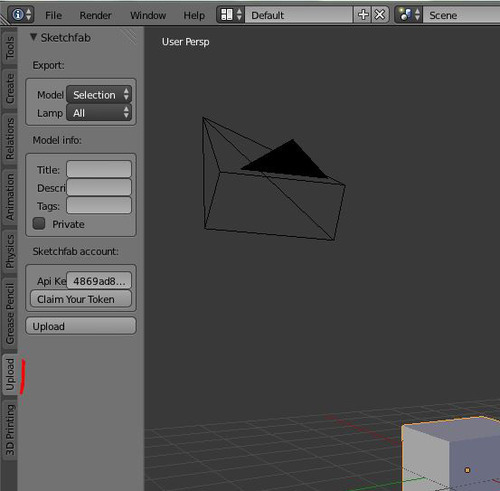 All of Blender's lamp types except Area are supported. Area lights will be converted to Hemi. You can also use an environment for image-based lighting, which will be covered later in this tutorial. Title: This is the name of the Sketchfab model you're about to upload. Description: Describe your model in a few sentences. Tags: This lets you specify tags for your model, separate tags with a comma. The Private checkbox finally lets you upload your model as private and only be visible to the people you choose to. This option requires a PRO account to work. This is maybe the most important setting, as it tells the Sketchfab exporter which account the model should be uploaded to! 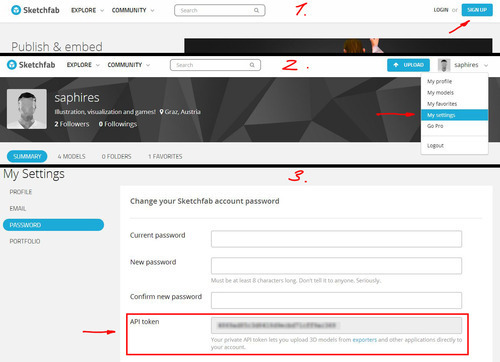 You'll need to enter your unique API token, which you can find in the Password settings of your Sketchfab account. You can also click Claim your token inside Blender, which prompts you to enter your email address and get a Sketchfab token. Additionally a button reading View Online Model will be displayed under the Upload button, which should open your model in a web-browser. But we are only half done at this point. Now that the model is uploaded we have to fine-tune the settings and materials. 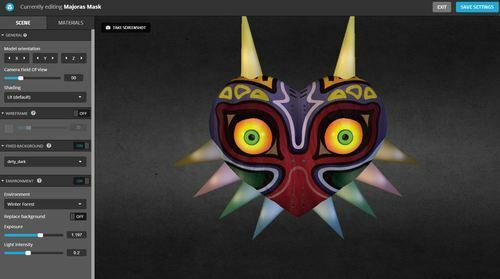 Head to Sketchfab and hover over your thumbnail image in the top-right corner. Click Models in the drop-down. It probably won't have any textures applied to it, but don't worry, we'll take care of that now. Click on it to view the model and find the orange Settings button underneath, which opens a submenu if you hover your mouse cursor over it. If you click on Properties you can change or add to the title, description and tags. But we are looking for the 3D Settings now, so click on this menu entry. Here you can change settings like the model's orientation, camera properties, shading mode, wireframe view, and so on. Most of the settings are pretty self-explanatory again. Under Fixed Background you can change your background, or even turn it off completely. PRO accounts can even define their own custom backgrounds. From the dropdown menu at the top you can choose which material to edit. Because of this it was important to give proper names to your materials in Blender, remember? So choose a material to edit and you'll see the individual components like diffuse, specular color, gloss, normal map, etc. With the little switch next to each components name you can turn this component on or off and with the slider underneath you can control the amount this component is contributing to the material. If you don't know what an individual component is used for just hover over the little ? next to its name. To add a texture to a component of the material click on the square that is on the left hand side of the slider. In the floating window that pops up select Texture → Manage Textures and then Import Texture. After clicking on Import Texture just find the texture file on your hard drive and open it. You can do this for each component you have a separate texture for, usually that's color, specular-color, glossiness and bump/normal. You can also apply a pre-baked lightmap if necessary or a separate texture for transparency. I wanted the eyes of my model to glow a little, so I added the color texture also in the Emission component and turned up its power a little. In the Environmental Reflection tab you can then fine tune how much each material should reflect the environment. And under Faces Rendering you find options to turn a material two-sided or single-sided. 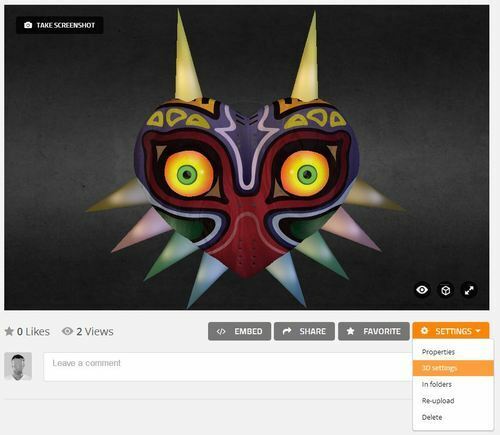 You can find out more about Sketchfab's native 3D Settings in Material Editor. As a last step rotate your model so it looks nice and click on Save View to get a nice thumbnail for your model. And that's basically it, play with the settings some more until you are satisfied and then share your model with the world! I hope this guide was helpful. Let me know in the comments! We'd like to thank Phil for this in-depth tutorial, we're sure our Blender users will find these tips valuable.The original tutorial can be found here. Hmm, does it happen on any upload attempt? What operating system version are you using?